Give your referral form to the Howard County Food Bank to access our gluten free and allergy friendly items. Go to the Howard County Food Bank and ask for access to S.A.F.E. 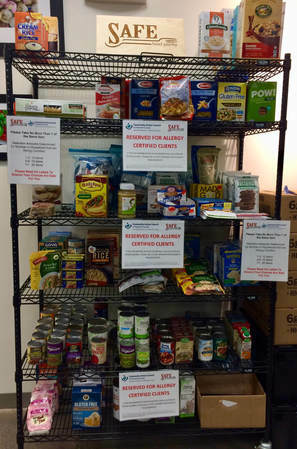 Food Pantry's dedicated gluten free and allergy friendly shelves. This picture of our S.A.F.E. Food Pantry shelves shows the types of products that can be found on our shelves at the Howard County Food Bank. Items can vary from week to week based on incoming donations and items selected by clients. Where is the Howard County Food Bank?